Roberto da Costa has had a fascinating journey in Marvel Comics. He was originally introduced in the ’80s as part of the teenage New Mutants, and would stick with the team when it was rebranded as the more extreme X-Force of the ’90s. He was a member of the supervillain organization the Hellfire Club, went back to being a New Mutant as part of the adult iteration of his old team, and then got a major profile boost when he was welcomed into the Avengers with his best friend Sam “Cannonball” Guthrie. Roberto has since become a very active presence in the larger Marvel Universe, taking over the evil scientist group A.I.M. (Advanced Idea Mechanics) in the most recent New Avengers series, and then selling A.I.M. to the U.S. government in U.S. Avengers. That last move wasn’t the smartest given that the U.S. government is under Hydra’s control right now, and after taking a shot to the head, Roberto is healed and very pissed off. 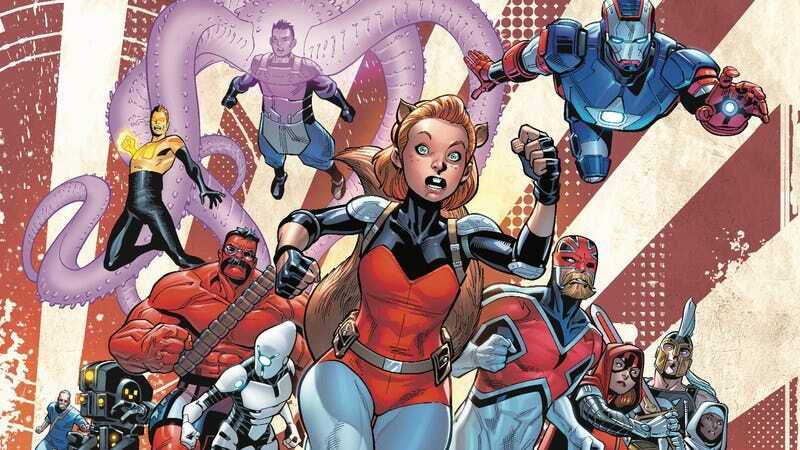 Writer Al Ewing has done exceptional work building on Roberto’s character in both New Avengers and U.S. Avengers, turning him into a captivating, highly competent team leader that isn’t afraid to take big risks if they mean big rewards. This exclusive preview of next week’s U.S. Avengers #9 has Roberto unleashing his fury on agents of Hydra as he and teammate Toni Ho make their escape, and even though his health is in a precarious state right now, that won’t stop him from fighting. The art team of Paco Medina, Juan Vlasco, and Jesus Aburtov brings a lot of energy to the action in these pages, and it’s developed a strong rapport with Ewing over the course of both New Avengers and U.S. Avengers. These creators know how to create dynamic superhero stories rooted in compelling character work, and they’re responsible for one of Marvel’s most consistently entertaining team books right now.